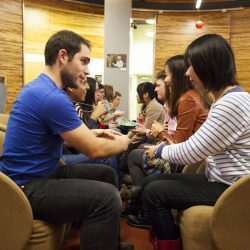 The UBC tandem Language Learning Program is a free initiative, in which participants that wish to improve their conversational fluency in a language are matched with a partner who speaks this language fluently, and at the same time wants to improve in the language the first person speaks. 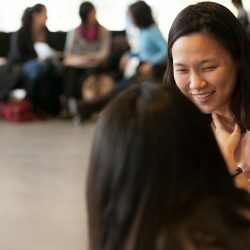 It is a program designed to build community through additional language acquisition, foster intercultural communication, and enhance cross-cultural understanding on campus. The program runs for 10 weeks each semester, and pairs are expected to meet once a week for 1.5 hours in order to teach each other their mother tongue (or a language in which they are highly proficient). 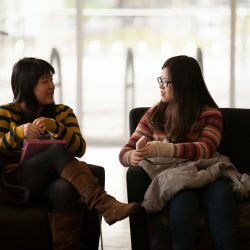 Participants can choose to meet i) during weekly, on-campus, facilitated sessions, which take place at the Global Lounge, or ii) they can choose to meet independently. In both cases, participants are supported with suggested activities and Conversation Guides from the Facilitator Guidebook. More information can be found under the Session Times tab. We—coordinators, facilitators, and volunteers—create a community where people can access and engage in activities in different languages, but at the same time, participants understand that they are the ones responsible for learning. We expect partners to give and take equally. Likewise, we—coordinators, facilitators, and volunteers—expect to give and take equally with each other and all participants. At tandem, we believe everyone’s language has the same value. No matter what you look like, where you come from, how your accent sounds, you can still enrich someone’s language learning experience. We are all responsible for creating a community of respect, and this means valuing and celebrating diversity!